Colors of the West explores wild places through the lens of watercolor en plein air painting, a French term meaning literally in the open air. Steeped in the natural world, award-winning artist Molly Hashimoto has sketched in the outdoors and worked as a plein air artist and teacher for more than 20 years. In that time she has filled more than 40 sketchbooks with landscapes, vignettes, studies of flora and fauna, and natural history notes all created while visiting some of the West/s most stunning landscapes. This new book is organized by color, a unique approach to teaching both intermediate and budding artists how to really see color in the outdoor spaces around them, and then apply it to journals, other art projects, or simply beautiful memories. The average person can see 17,000 colors (! 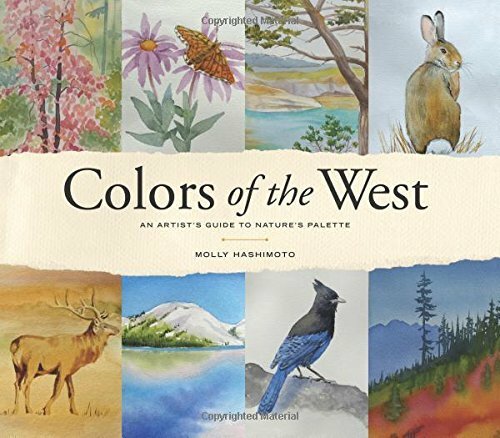 ), so Molly explains the concept of palette, that is the range of colors that unites elements of geography, geology, and the different kinds of light created by atmosphere, season, and latitude. 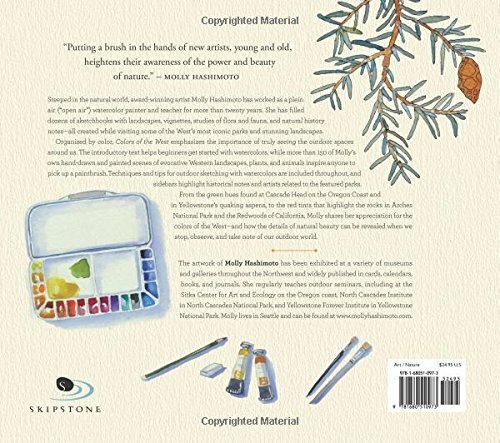 Molly's own hand drawn sketches and paintings of familiar Western landscapes help convey these colors, along with sidebars and insets on individual species (trees, birds, mammals, and other flora and fauna) and historical notes related to the park or site she has sketched. Tips and techniques for outdoor journaling and painting are included throughout. From the green hues found on Cascade Head on the Oregon Coast and in Yellowstone's quaking aspens, to the reds that highlight the rocks in Arches National Park and the Redwoods of California, readers and artists of all levels will learn a new appreciation for the colors of the West and how the details of natural beauty can be revealed when we stop, observe, and pay attention to the outdoor world.